The Gaggia Brera features an elegant brushed stainless steel front panel and a compact design that is much more space efficient than most machines in its class. But don’t let its size fool you, this super automatic is packed with clever features and advanced technology. All of the parts used for daily operations—the coffee bean container, grounds disposal, water tank, and drip tray—are accessible from the front of the machine for easy access and maintenance. In addition, this model has a very intuitive, user-friendly interface—with push-button controls and a large display. Dedicated icons for grinding, brewing, and steaming functions have been color coded for quick reference. Whereas user controls are simple and straightforward, the Brera’s mechanical functions are undeniably sophisticated. An Optidose feature lets you control the strength of your espresso; the machine can also memorize drink volume to deliver a truly customized beverage. You can brew with pre-ground coffee, thanks to the integrated bypass doser. But, should you wish to take advantage of the Brera’s grinding functions, the durable ceramic grinder won’t disappoint. This machine uses the Gaggia Adapting System to monitor and automatically adjust the grind time, based on your beans, to deliver the exact quantity of coffee selected. Gaggia Brera Espresso Machine. 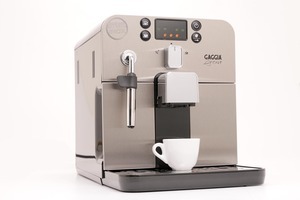 The new face of traditional Italian espresso, the Gaggia Brera features an elegant brushed stainless steel front panel and a compact design that is much more space efficient than most machines in its class. But don't let its size fool you; this super automatic takes full advantage of advanced technology—allowing it to go toe-to-toe with the industry's heavyweights. Right out of the box, the first thing I noticed about the Gaggia Brera is its size - really much smaller than expected! The manuals that came with the machines are helpful and set up was pretty painless. In a household that just can’t agree on anything to do with coffee, this machine is an argument saver. It lets you set drink strength, from light to medium and strong, so that each person can do their own thing without interfering with other people’s drink. There’s also a grinder knob that lets you change how fine or coarse the coffee is and a button that lets lets you adjust how much coffee is used per shot. Once everything’s set, there’s a memory button option so the machine can actually “remember” your settings. You can even use pre-ground coffee, if you want, since there’s a bypass doser. The Brera self rinses after every time it brews and goes into standby mode after an hour to cut down on energy usage. Pretty much the only thing not automated on this machine is frothing, which is easy enough to do with the Pannarello steam wand that doubles as a hot water dispenser. Overall, it’s a good value for the money. The stainless steel is a nice touch and the entire thing seems well built.